James Lick (seated) owned Santa Catalina Island from 1867 to 1887. Catalina Island was occupied by the Union Army (Captain West and Company C, 4th California Infantry) from January 1, 1864 until September 14, 1864. When the troops arrived at the Isthmus, Sven Larsen had already been squatting on the island for a number of years, and he owned ten head of cattle. Although the Indian reservation plan was never completed, and the Civil War military personnel left the island in September 1864, the barracks built remain as a monument to the Civil War, World War II, and even a little Hollywood magic. Several people stayed at the Isthmus, including Ben Weston and Tom Gallagher. In 1882, Thomas William Whittley was born at the Civil War barracks in 1882. At the end of the 19th century, two wings were added to the Barracks, and the original north side of the barracks became the central front portion of the building. 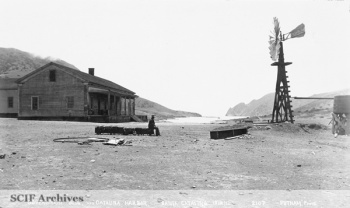 During the 1920s and 1930s, Hollywood film crews used the Two Harbors Barracks as housing while they transformed Santa Catalina Island into the South Pacific for movies like Mutiny on the Bounty and Old Ironside. During World War II, the U.S. Coast Guard used the barracks as a training station for new recruits. 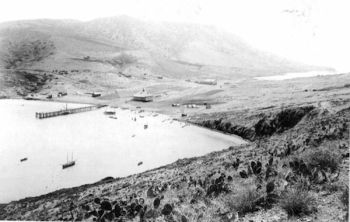 Since 1951 the barracks have been leased and managed by the Isthmus Yacht Club, Santa Catalina Island. This page was last edited on 26 September 2015, at 19:09.